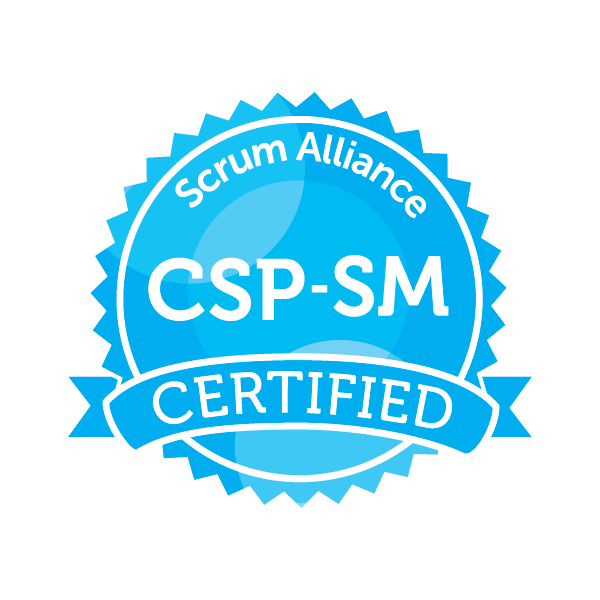 The Certified Scrum Professional® For ScrumMasters (CSP-SM®) is for practicing ScrumMasters/Team Coaches with 2 years’ experience and those who have already attained the Scrum Alliance Advanced Certified ScrumMaster™ (A-CSM™) qualification. This step in the ScrumMaster journey is a combination of a 2 day workshop, applied learning on the job and reflective learning as part of online group coaching sessions. This programme is aimed at practicing ScrumMasters, allowing them to grow skills such as facilitation and coaching, and build knowledge to better serve Development Teams, Product Owners and the wider organisation. It focuses on growing ScrumMasters as organisational change agents and will further deepen their coaching and facilitation skills. The 2 day workshop build on a combination of interactive exercises, practical real-life examples, and lively discussion and will equip you with the knowledge required to be a professional ScrumMaster. However the real learning happens through application and reflection, so following the workshop there will be a 3 online group coaching sessions (2 hours each). These will allow you to reflect on how you are applying your knowledge and skills. The coaching sessions are an essential part of the learning and you will be expected to attend. This course is for ScrumMasters with at least two years experience in the role. You must have Agile experience as the course will build on your experiences in order to deepen your understanding of Agile and yourself. Attendees should re-familiarise themselves with the Scrum Guide, other pre-reading will be sent out in the joining instructions.